Anniversaries are special occasions for couples. Milestone anniversaries are especially treasured. Whether you are spending a quiet evening together or having a celebration with friends and family, why not celebrate your anniversary with a luxurious limousine? Limousines are a safe and relaxing way to get to the show, restaurant, catering hall or wherever you are celebrating your special anniversary! You can trust Cruise Control Limousine for all your once in a lifetime events to get you and your loved ones where you need to go in a stylish, memorable and safe manner. We offer luxurious vehicles of all different sizes, for groups of two to thirty or more. And our priorities are your safety and enjoyment. Make your night as memorable as it should be! For questions and reservations call 516-797-7454. Additionally, we hold an open house every Wednesday from 7:00 PM – 9:30 PM, in our Lindenhurst showroom. 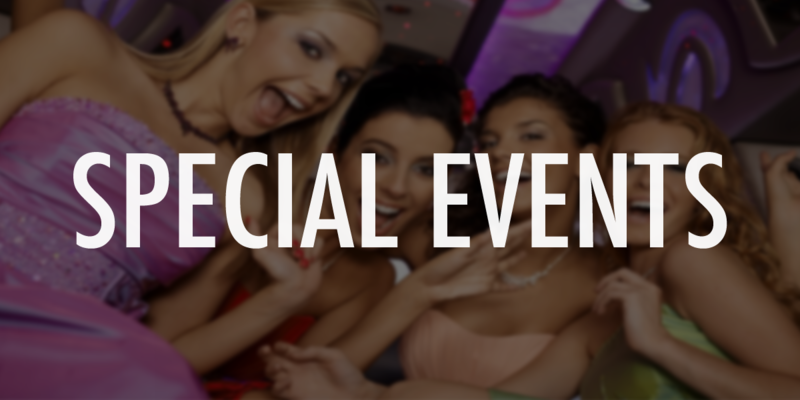 Travel in style in a stretch limousine or party van to your Long Island prom. Next to your wedding, your prom is one of the most exciting nights of your young life. As you can see, we offer luxurious vehicles of all different sizes, for groups of two to thirty or more. And our priorities are your safety and enjoyment. Make your night as memorable as it should be! For questions and reservations call 516-797-7454. Additionally, we hold an open house every Wednesday from 7:00 PM – 9:30 PM, in our Lindenhurst showroom. Sometimes there is no official “occasion”. Sometimes there is just a night on the town. Maybe you are seeing a play or going to the opera or just out to dinner. No matter the destination, Cruise Control Limousine will be there to get you there and back in luxurious style. You can trust Cruise Control Limousine for all your once in a lifetime events to get you and your loved ones where you need to go in a stylish, memorable and safe manner. Cruise Control Limousines offers both group and private Wine Tours to vineyards from around the state of New York. Group tours, also called shared tours, are offered nearly every day of the year from 11am – 5pm. Each of our group wine tours are directed by one of our knowledgeable chauffeurs who are prepared to help each person on the tour have an awesome experience. Our extensive and diverse fleet of cars is designed to accommodate up to 42 people on any given group tour (2 people minimum – 42 maximum.) Vineyard selection is ultimately determined by one of several factors such as winery schedules, winery traffic, chauffeur experience, etc. Private Tours are available only upon request and must be booked no less than 14 days in advance. All private tours will not require a minimum number of passengers to attend the tour. Please check with your Cruise Control Limousine booking specialist for further information. Please note: there is no consumption of alcohol allowed in the vehicle on shared tours. Having a baby is such a special occasion. Bring home your newest addition in a safe, relaxed limousine. Mom will especially appreciate being treated like a queen and the rest of the family can ride without the stress of traffic issues. You can rest assured you and your “precious cargo” will arrive home safely and in style. You can trust Cruise Control Limousine for all your once in a lifetime events to get you and your loved ones where you need to go in a stylish, memorable and safe manner. Congratulations on your upcoming wedding. When there is a wedding, there is usually the precursory bachelor/bachelorette party. Be certain everyone has a good time and gets home safe while riding in a stylish and luxurious limousine from Cruise Control Limousine. You can trust Cruise Control Limousine for all your once in a lifetime events to get you and your loved ones where you need to go in a stylish, memorable and safe manner. Having a special birthday party? Is it the big 5-0, your 21st or 30th? Maybe your planning a surprise birthday party for a loved one. Whatever the circumstance, what a perfect way for the guest of honor to arrive than by luxurious limousine. How special he/she will feel! You can trust Cruise Control Limousine for all your once in a lifetime events to get you and your loved ones where you need to go in a stylish, memorable and safe manner. When you plan a night out to see one of your favorite performers wouldn’t it be great to not think about the transportation? Nobody needs the assignment of designated driver. All of your friends can get to the concert and arrive home later in style and safe. With Cruise Control Limousine you can have fun and be safe! You can trust Cruise Control Limousine for all your once in a lifetime events to get you and your loved ones where you need to go in a stylish, memorable and safe manner. Congratulations on your upcoming bat mitzvah or bar mitzvah. For this momentous occasion, why not treat your child and his/her friends or maybe your family to a memorable ride from the temple to the party in one of our luxurious limousines? What a dream come true for your child to enter into adulthood by arriving to the party in style! You can trust Cruise Control Limousine for all your once in a lifetime events to get you and your loved ones where you need to go in a stylish, memorable and safe manner. Thank you so much for the gorgeous limos & coach bus for our wedding! The Boyce has used you guys for decades. As always, your service and professionalism is amazing. Thank you for everytime you have helped us and especially for part of my special day! Thank you for making my wedding dreams come true. We are truely grateful! Thank you for completing our amazing day. The drivers were Exceptional! We sincerely thank you for celebrating our joy and for being a part of our lives. Thank you so much for helping us ride through our special day in style. Everyone had a wonderful time and we thank you for a friendly, courteous, and professional staff. Thank you so much for doing such a great job on our wedding day. Your professionalism and caring service was evident and greatly appreciated. We will highly recommend your service to others. Thank you for providing such excellent service on our special day. Everyone loved the bus! We had such a blast and the trolley at the end of the night was so amazing! Thank you for such amazing looking vehicles and timely service. All drivers have the proper permits and licensing. – All vehicles are well maintained, and clean safety checked. Professionally trained chauffeurs are always courteous, prompt and are knowledgable of the ti-state area, we can supply corporate references upon request.